A Love Unlike Any Other – Hi Blog! I'm Dad. I get a lot of compliments about my daughter. People tend to be impressed with Olivia’s quick wit or intelligence and love to tell us about it. Their words are usually full of examples from conversations they shared with her and always bring a smile to my face. She’s so talented in so many things she does. I couldn’t be prouder of the person she’s growing up to be. The compliments others have for my son, Lucas, tend to be more superficial, but not necessarily in a bad way. Friends and family will comment about how “sweet” or “cute” he is. While that brings a smile to my face as well, I know that there is so much more to what makes him a wonderful part of my life. That’s not to say that I don’t appreciate the nice things people say about him. Quite the contrary. I don’t fault them for focusing on surface qualities. 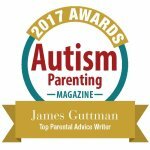 As someone who is non-verbal with Autism, he doesn’t engage them in conversation and, depending on the person, he might not want to interact with them at all. In some cases, it could lead to him being almost invisible around guests in our home as he runs from different rooms, watching his TV shows, and playing his iPad games. It’s not uncommon for someone to forget to say hello or goodbye to him. I know it’s not out of malice, but, if I’m being honest, it does bother me when it happens. I’ll usually lead him by the hand to our arriving or departing guest and ask him to wave. He obliges and while our visitor wouldn’t be offended if he didn’t greet them, it doesn’t matter. It’s not about them. I do wish more people could know Lucas the way I do. His wonderful traits go well below the surface and affect so many aspects of his personality. My son is by far the realest person I know. The same personality quirks that others might see as negatives are actually parts of his biggest positives. At times I’ve wondered if some people think my glowing praise for him is done for show. I mean, they see a very small amount of what he does and, I’m sure to some, it seems like I’m exaggerating his positives in order to convince myself. The reality, though, couldn’t be further from the truth. The relationship we share is genuine in a way unlike any other in my life. It’s the most unique love I’ve ever experienced. When I get Lucas up in the morning, he’s thrilled when I arrive. The moment he spots me, he begins clapping and hopping around. As I step into the room and he turns the light on, we’re already laughing, jumping, and hugging. I feel like a celebrity who just won the World Series every single morning before I even take a sip of coffee. No matter how awful of a day I have planned, seeing him at the start of it all always guarantees that it begins on a high note. It’s the polar opposite to the reaction that he gives so many other people. I recognize that and I appreciate it more than I can express in words. Uh oh. You’re being so sweet. How much is it going to cost me? Ha ha. I know many people don’t see this side of him and, again to be honest, that makes it all the more special. His love for me is genuine and not just something he does freely for everyone. His desire to include me in his world stands in contrast to the way he treats many others. It makes me feel far more important than any handwritten notes, first grade drawings, or anything else that some might think I’m sadly missing out on by having a son on the Autism spectrum. Everything he does is real in the most literal sense. When Lucas likes something, it’s because he likes it. It’s not because another kid at school has convinced him it’s “cool” or because a commercial tricked him into begging us to take him to Toys R Us. The toys, apps, treats, and entertainment he consumes are all chosen exclusively by him. It’s a trait that many of us wish we had. Every big talker on Twitter telling the world how #real they are, have nothing on my kid. For those who only experience Autism from the sidelines, it might seem cold and distant. That’s because as a visitor to our home, you don’t see the full picture. If he doesn’t know you, Lucas will most likely ignore you. That’s why it’s so special when he does know and care about you. His wide eyes and smile can brighten your day in an instant. It’s not something he gives away to everyone in order to scam a reward. His love and admiration are things you have to earn and when you do, there’s nothing like it. He might never say my name or make me a Father’s Day card, but what he does give me means so much more. No one should ever be sorry that I have a child who can’t do those things. If anything, I’m sorry that more people won’t ever get to experience a love unlike any other I’ve ever known.